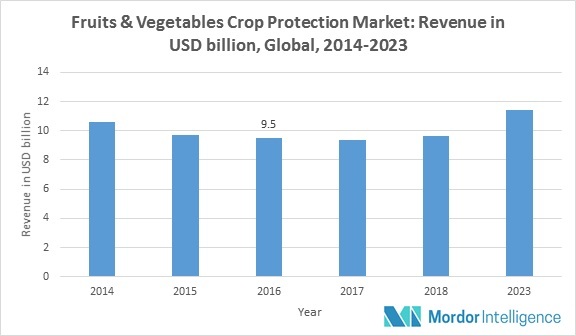 The global crop protection market for fruit & vegetables was valued at USD 9.5 billion in 2016 and is expected to register a CAGR of 3.5% during the forecast period, 2018-2023. The market is highly consolidated, with a few players dominating the market across different geographical regions. The market players are mostly focusing upon the R&D, mergers and acquisitions, and new product launches to increase their market share. Countries like India, Argentina, Brazil, and China are witnessing a high demand for fruit and vegetables and the rising import quantities of fruit and vegetables are a clear indication of the same. To meet the demand, farmers use products that enhance the growth of the crops and protect it against various diseases and pests. This increase in demand is expected to drive the crop protection market for fruit and vegetables. The annual report from the Environmental Working Group (EWG) ranks fruit and vegetables based on the levels of pesticides and calls it the ‘Dirty Dozen’, since it includes fruits and vegetables considered "dirty" because of the high levels of pesticide residue in them. The increasing demand for food safety and quality, stringent government regulations on food products, and increased number of quality checks have increased the demand for bio-based crop protection products in the market. Companies like Marrone Bioinnovations are constantly investing in the R&D of bio-based crop protection products to increase their market presence. Major Players: Adama Agricultural Solutions Ltd. (Israel), BASF SE (Germany), Bayer Cropscience AG (Germany), Dow Agrosciences LLC (United States), FMC Corporation (United States), Monsanto Company (United States), Nufarm Ltd (Australia), and Syngenta International AG (Switzerland), among others.